Lower right: "Gustave Courbet. / ..62"
Gustave Courbet, who had previously painted less than a handful of flower pictures, took up the genre enthusiastically during a stay in western France in 1862. Intending to visit his friend Etienne Baudry for two weeks, he arrived at the garden enthusiast's château in May and remained in the area for eleven months. With his friend's encouragement, Courbet explored flower painting using Baudry's extensive gardens, greenhouses, and library of botanical books. He painted about twenty flower pictures and remarked to a friend, "I am coining money out of flowers." Courbet had visited Holland in 1847 and his exposure there to Dutch flower painting is evident. His arrangement shares the exuberant spontaneity and abundance of Dutch artist Jan Van Huysum's Vase of Flowers. Like his Netherlandish forebears, Courbet chose flowers that bloom at different times of the year: lilies, roses, gladioli, stock, asters, ipomoeas, poppies, and others. While he typically eschewed allegory, Courbet may have also followed the Dutch practice of using ephemeral flowers to suggest the transitory nature of life and human happiness. Unlike Van Huysum and other Dutch painters known for their intricately detailed technique, Courbet used broad brushstrokes and often spread his thick paint with a palette knife. Frédéric Mestreau, 1825 - 1891 (Château de Terrefort, near Saintes, France), possibly acquired from the artist, 1862; by inheritance within the Mestreau family, 1891. "Exposition de peinture. II. M. Courbet." L'indépendant de la Charente-Inférieure (January 29, 1863), p. 6. Explication des ouvrages de peinture et de sculpture exposés dans les salles de la mairie au profit des pauvres. 160 tableaux signés Corot, Courbet, Auguin, Pradelles, exh. cat. (Saintes: Imprimerie d'Alexandre Hus, 1863), p. 6, no. 77. Conil, Pierre. "L'exposition de peinture de Saintes." Le courrier des Deux-Charentes (February 12, 1863), p. 4. Castagnary, Jules-Antoine. "Les fleurs." In Courbet raconté par lui-même et par ses amis. Vol. 1, Sa vie et ses oeuvres (Geneva: Pierre Cailler, 1948), p. 168. Bonniot, Roger. 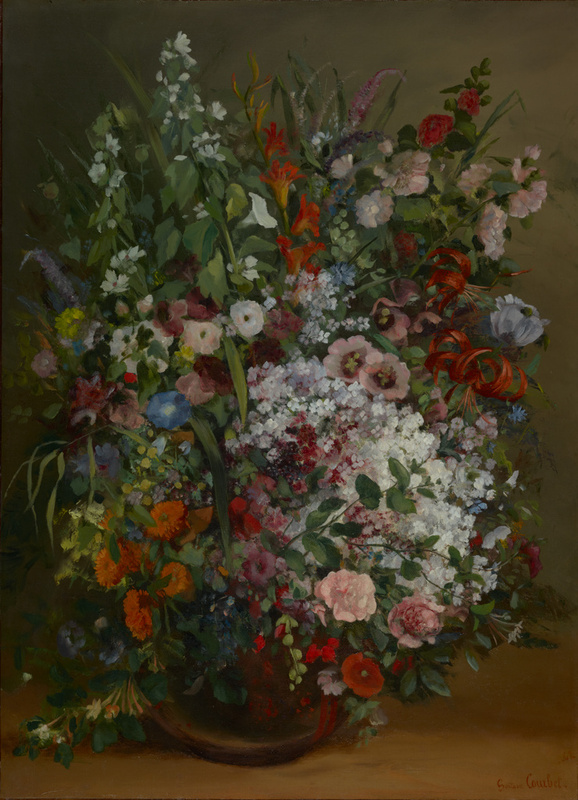 "Un tableau de fleurs inédit de Gustave Courbet." Bulletin de la Société de l'histoire de l'art français. Année 1957 (1958), pp. 77-87, ill.
Bonniot, Roger. Gustave Courbet en Saintonge, 1862-1863 (Paris: C. Klincksieck, 1973), pp. 230, 242, pl. 7, fig. 13. Lindsay, Jack. Gustave Courbet: His Life and Art (New York: Harper and Row, 1973), pp. 178, 315, 356n44, 368n27. Seven Masterpieces of French Painting from the Collection of Mrs. Florence Gould, exh. cat. (San Francisco: Fine Arts Museums of San Francisco, 1974), pl. 1. Fernier, Robert. La vie et l'oeuvre de Gustave Courbet: Catalogue raisonné. 2 vols. (Geneva: Fondation Wildenstein, 1977-78), vol. 1 (1977), pp. 172-73, no. 302, ill.
"Better than Bouguereau? Art & Auction's Survey of the Most Overrated and Underrated 19th Century Art." Art & Auction 7, no. 7 (February 1985), p. 62, ill.
Art at Auction: The Year at Sotheby's, 1984-85 (London: Sotheby Publications, 1985), p. 92, fig. 4. Daulte, François. "Florence Gould et les arts." L'Oeil, no. 356 (March 1985), p. 42, cover ill.
Art & Auction 7, no. 9 (April 1985), cover ill.
Sotheby's, New York. Impressionist Paintings and Drawings from the Estate of Florence J. Gould. April 24, 1985, unpaginated, lot 11, ill.
"The Gould Auction: An International Event." Sotheby's Newsletter (April 1985), pp. 3-4, ill. "Acquisitions/1985." The J. Paul Getty Museum Journal 14 (1986), p. 221, no. 132, ill.
Bonniot, Roger. Gustave Courbet en Saintonge: Scènes de la vie artistique en province sous le Second Empire (Semussac: La saintonge littéraire, 1986), pp. 88, 213, 230-31, pl. 10, fig. 17. Hoving, Thomas. "Money and Masterpieces." Connoisseur 216, no. 899 (December 1986), p. 98. Fredericksen, Burton B. Masterpieces of Painting in the J. Paul Getty Museum. Rev. ed. (Malibu: J. Paul Getty Museum, 1988), unpaginated, no. 38, ill.
Faunce, Sarah, and Linda Nochlin, eds. Courbet Reconsidered, exh. cat. (Brooklyn: Brooklyn Museum of Art, 1988), p. 148, no. 42, ill., entry by Rae Becker. Hardouin-Fugier, Élisabeth, and Étienne Grafe. French Flower Painters of the 19th Century: A Dictionary (London: Philip Wilson, 1989), pp. 56-57, 156, ill.
Koch-Hillebrecht, Manfred. Museen in den USA: Gemälde (Munich: Hirmer Verlag, 1992), pp. 278-79, ill.
Bajou, Valérie. Frédéric Bazille, 1841-1870 (Aix-en-Provence: Edisud, 1993), pp. 42, 121, fig. 62. Loyrette, Henri, and Gary Tinterow eds. Impressionisme: Les origines, 1859-1869, exh. cat. (Paris: Galeries nationales du Grand Palais, with Réunion des musées nationaux, 1994), pp. 174-75, 179, 356, no. 40, fig. 220, entry by Henri Loyrette. Tinterow, Gary, and Henri Loyrette, eds. Origins of Impressionism, exh. cat. (New York: Metropolitan Museum of Art, with Harry N. Abrams, 1994), pp. 175-76, 179, 358, no. 40, fig. 220, entry by Henri Loyrette. Georgel, Pierre. Courbet: Le poème de la nature (Paris: Gallimard, with Réunion des musées nationaux, 1995), pp. 95, 170, ill.
Przyblyski, Jeannene Marie. "Le parti pris des choses: French Still Life and Modern Painting, 1848-1876." Ph.D. diss. (University of California, Berkeley, 1995), p. 229n7. Jaffé, David. Summary Catalogue of European Paintings in the J. Paul Getty Museum (Los Angeles: J. Paul Getty Museum, 1997), p. 29, ill.
Whelan, Richard. Impressionist Flowers: Art of the Bouquet (Cobb: First Glance Books, 1998), pp. 28-29, ill.
Southern Humanities Review 33 (Spring 1999), cover ill.
Rathbone, Eliza E., and George T. M. Shackelford, eds. Impressionist Still Life, exh. cat. (Washington, D.C.: Phillips Collection, with Harry N. Abrams, 2001), pp. 50-51, 204, pl. 1, entry by George T. M. Shackelford. Przyblyski, Jeannene M. "The Makings of Modern Still Life in the 1860s." In Impressionist Still Life, exh. cat. Eliza E. Rathbone and George T. M. Shackelford, eds. (Washington, D.C.: Phillips Collection, with Harry N. Abrams, 2001), p. 30. Shackelford, George T. M. "Impressionism and the Still-Life Tradition." In Impressionist Still Life, exh. cat. Eliza E. Rathbone and George T. M. Shackelford, eds. (Washington, D.C.: Phillips Collection, with Harry N. Abrams, 2001), p. 23. Sotheby's, New York. Property of the Greentree Foundation, from the Collection of Mr. & Mrs. John Hay Whitney. May 5, 2004, pp. 84-85, under lot 17, fig. 1. MacDonald, Heather, and Mitchell Merlin, eds. Working Among Flowers: Floral Still-Life Painting in Ninetheeth-Century France, exh. cat. (London and New Haven: Yale University Press, 2014), pp. 99, 103, no. 20, ill., entry by Mitchell Merling. Hilaire, Michel, and Paul Perrin, eds. Frédéric Bazille (1841-1870) and the Birth of Impressionism, exh. cat. John Lee, trans. (Montpellier: Musée Fabre, with Flammarion, 2016), p. 274, no. 93. Colodiet, Stanislaus. “Bazille and the Still Life.” In Frédéric Bazille (1841-1870) and the Birth of Impressionism, exh. cat. Michel Hilaire and Paul Perrin, eds. John Lee, trans. (Montpellier: Musée Fabre, with Flammarion, 2016), pp. 90, 92, fig. 49.